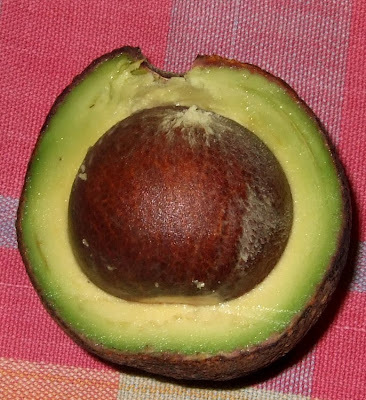 A couple of months ago I had the good fortune to find a delicious seedless avocado at my local grocer, but you can't bet on this sort of thing happening every time. This week, the same grocer sold me Big Stony, seen above, with barely a third of an inch of pulp insulating a billiard ball-sized pit. Big Stony was as tough and bland as Almond Girl was satiny and voluptuous, so there would seem to be an inverse pit-size to lushness correlation. يوم عسل ويوم بصل - Yom asal weyom basal - a day honey and a day an onion. If the avocado isn't so good, maybe it can be used to make Imogene Coca fruit soup--bananas, avocados, and figs. What a great proverb! Thanks so much. Of course, I love onions, so for me A day of honey and a day of onions just means day after day of delights. Thanks also for my first quadrilingual comment. You can only make fruit soup with the best avocados. I love that you have discovered the secret to lusciousness! what I need to discover is how to gauge lusciousness BEFORE cutting into the avocado!